Because they secretly hate you for drinking six Manhattans on a Tuesday while they're forced to serve them to you, PDX's top service industry titans get after it a bit themselves once you're hurled out the door. Now they dish on who did it best in 2012. 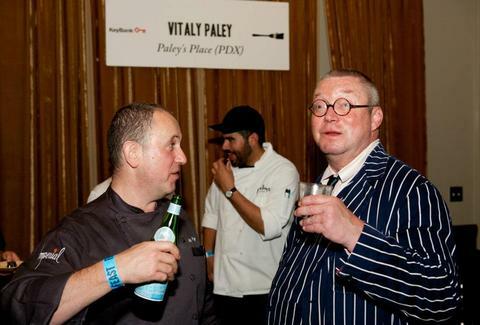 Brandon Wise, Bar Manager, Imperial/Portland Penny Diner "Nobody partied harder than chef Fergus Henderson of London's St. John, who literally wrote the book on 'tail to snout' cooking and was a guest in our kitchen all through the Feast Portland festival. I think he and the rest of our kitchen staff must have put a serious dent in the Fernet supply in Oregon that week. As for me, well, I plead the Fifth. Greg Denton & Gabrielle Quiñónez, Executive Chefs/Owners, Ox "Only one person comes to mind: Chef Fergus Henderson. He came to town for Feast, and we saw him at every event, party, and after party in town. That man can cut a rug! Gabe Rucker, Executive Chef/Owner, Le Pigeon "Definitely everybody at Feast, but the Lamb Jammers come in a close second. Ben Edmunds, Brewmaster, Breakside Brewery "I definitely had the worst hangover I've had in a long time after Wild About Game, so maybe that sort of stuff happens when the booze, food, and farm folks all get together. I don't think that I could hang with the bartenders at Cocktail Week. I have to get up too early the next morning to rage as hard as it sounds like those kids do. Mike Thelin, Co-Founder, Feast Portland "It took me a couple of weeks to get used to not seeing Fergus Henderson at every bar, restaurant, and party in town. Tommy Habetz, Chef/Co-owner, Bunk Sandwiches/Trigger "The after-party revelers at Feast! I think I went to seven after-parties. It was bonkers, and so much fun seeing everyone out and having a blast every day and night four days in a row. Hands down, though I think it was the Feast organizers who take the cake with this. Chris Angelus, Founder, Portland Food Adventures "Kask's Nathan Gerdes made the cover of GQ as the Most Innovative Bartender in the USA. I think he'll be partying the hardest."